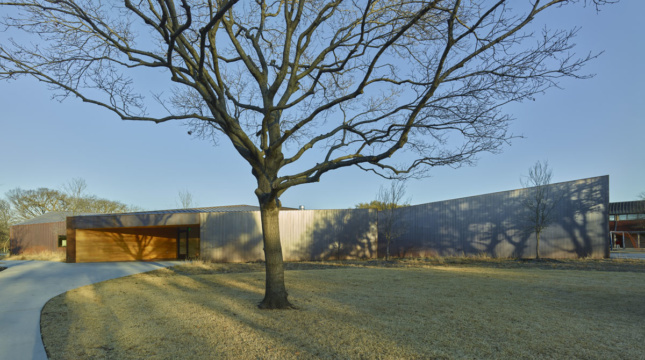 Both buildings were designed by Arkansas-based architect Marlon Blackwell and represent his first built works in North Texas. The Innovation Lab will be home to a new teaching kitchen, environmental science spaces, a robotics lab, and a woodworking shop. The Lamplighter Barn will replace the campus’s former chicken coop, and with it, add an adjacent outdoor space for the animals of the campus to graze. 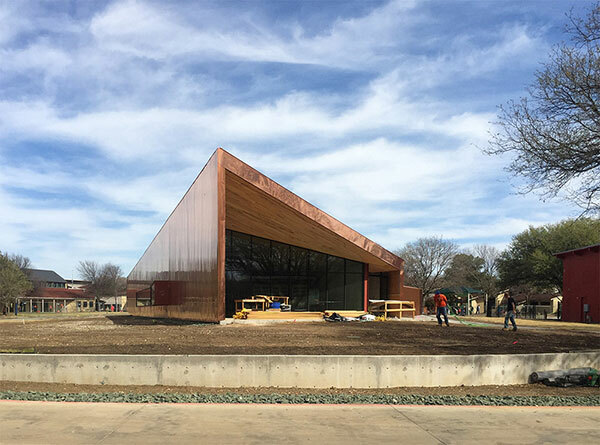 Although the Lamplighter Barn continues to use the traditional red wooden planks, in line with the beloved existing barn it replaces, the Innovation Lab takes a striking visual direction through linear design moves and the introduction of copper in a broad stroke. “Copper is a durable and elegant material,” Blackwell said. The patina that will form over time will create variation in the facade as it responds to the movement of the sun overhead. The intent to use a long-lasting material was essential to the campus’ direction from the outset. Blackwell’s team developed a profile and standing seam system in line with their experience through the use of similar materials and articulation on past projects. With contractors Hill & Wilkinson and Sterling Roof Systems, details and methods were coordinated prior to fabrication. The resulting concealed-fastener, flat-panel system provides a high-performance facade that minimizes the amount of maintenance required over the long-term life of the building. 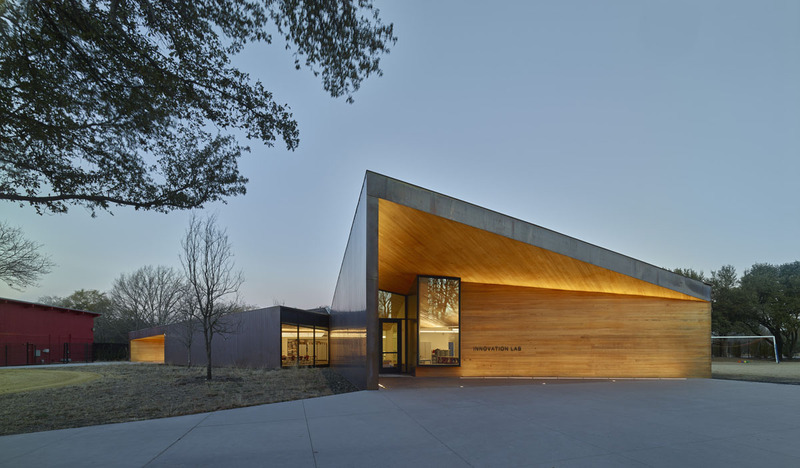 The Lamplighter School will be the focus of a panel discussion at upcoming Facades+ Dallas on February 20, 2018. Michael Friebele, the conference co-chair, will be moderating a conversation about how client requirements, site considerations, context, and history can improve building envelope design.